The Toyota Corolla has earned a reputation for reliability over the years, making it one of the most successful vehicles in Toyota’s lineup. But the Corolla was also known for pretty conservative styling, and in today’s competitive car market Toyota listened to its customers and made it a priority to improve the exterior and interior styling. 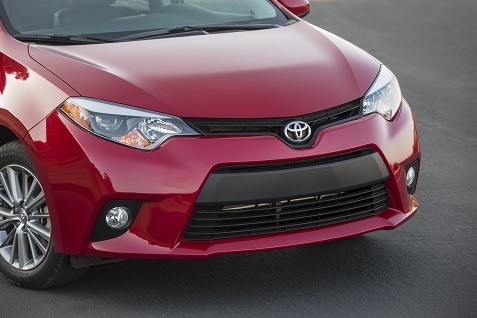 The result is a radically different front end for the all-new 2014 Corolla that sets the tone for the new model. The Corolla lineup also features sport model (the S) that has an even more aggressive look. Just take one look at the new front end of the Corolla and your impression of the vehicle will change immediately. It’s much more expressive with a large, trapezoidal grille under the LED headlights giving the Corolla a more memorable look (see first two images above). In the S model the grille shape is flipped to set it apart from the L, LE and LE Eco models, giving consumers an interesting set of choices (see images 3 and 4 above). The S model also has beautiful 17-inch alloy wheels that help the overall look of the car. The exterior dimensions have also changed a bit from the previous model as the new Corolla is a little longer and wider and also a little shorter. The interior of the Corolla has also been revamped with a horizontal design across the dashboard. The seats and materials have been improved and the overall driving experience was very comfortable. It’s pretty amazing how far these compact cars have come over the years. The steering wheel had a sporty feel to it and the addition of more soft touch materials made a difference in overall comfort. I had plenty of drive time with several of the Corolla models as Toyota prepared a number of routes in the Minneapolis area on a beautiful fall day. I started with the S as I wanted to see how the sportier model would drive and I came away impressed with the acceleration and handling. I’ve mentioned many times that I prefer vehicles that offer a separate sport mode and here drivers can choose between sport and eco settings. The Corolla felt more nimble and quick in sport mode which made it fun to drive, and still performed adequately in eco mode. Toyota offers a new Continuously Variable Transmission (CVT) that it calls the CVTi-S which has been designed to give a driving experience more similar to a traditional automatic transmission with the gear changes. The transmission has the feel of seven “gears” or shift points, and in the S model drivers can use paddle shifters to manually control the shift points. The S model does not offer a more powerful engine so buyers looking for small performance cars won’t be looking at this model, but the transmission and suspension changes improve the driving experience enough for many consumers. The LE Eco model was a very pleasant surprise as it performed well in both eco and sport modes. The Corolla offers a 1.8 liter engine that is rated at 132 horsepower, but the LE Eco has a 1.8-liter engine with Toyota’s “Valvematic” system which produces 42 miles-per-gallon on the highway and 140 horsepower. At the moment Toyota is projecting roughly 10% product mix for the LE Eco with 40% for each the S and LE, and capacity restraints will prevent that from going much higher in the short term. Still, it will be interesting to see if demand for this 42 MPG option causes the company to adjust its plans over time. The compact car segment has seen much more aggressive and interesting designs in recent years, so the new Corolla design should help get the attention of younger buyers. Overall this is an impressive vehicle. It’s always been a big seller, but the new design should attract plenty of new buyers considering the various options in this segment.